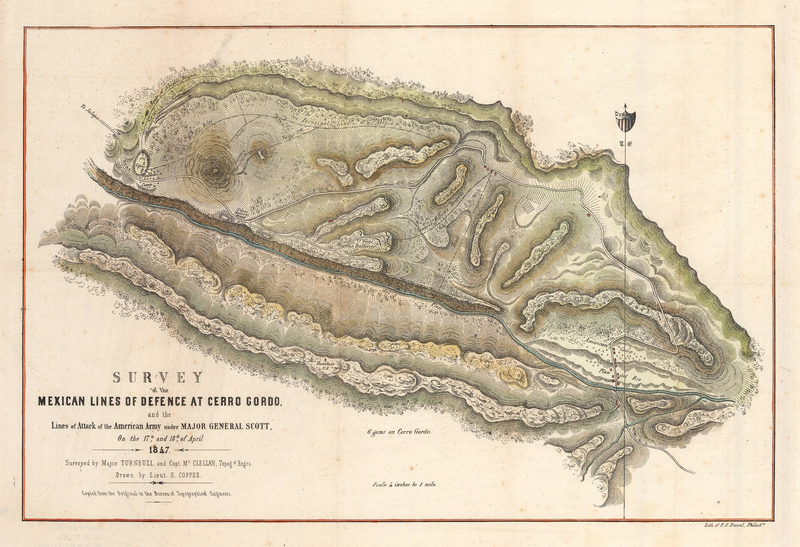 Home > Products > 1848 Survey of the Mexican Lines of Defence at cerro Gordo, and the Lines of Attack of the American Army under Major General Scott. 1848 Survey of the Mexican Lines of Defence at cerro Gordo, and the Lines of Attack of the American Army under Major General Scott. This highly detailed map illustrates one of the major battles of the Mexican American War. The confrontation known as the Battle of Cerro Gordo, took place at a mountain pass located about 60 miles northwest of Veracruz, Mexico. The battle marked the first serious resistance to be met by General Scott in the Mexican War, and American forces were outnumbered by approximately 3,500 troops when they met the Mexican forces of 12,000 men at the Plan del Rio. Santa Ana had taken a position at the mountain pass in order to avert General Scott’s advance in the direction of Mexico City. Fierce fighting ensued in which the Mexican troops ultimately broke rank and fled. Santa Ana escaped, but there were more than a thousand Mexican casualties and about 3,000 men were taken prisoner. American losses were significantly smaller with 64 killed and 353 wounded. Scott then moved on to Puebla and later to Mexico City. Condition: Map is in A condition with full margins, clean paper and not tears, staining, or pin holes.